Miriam Beckstein is happy in her life as a successful reporter. When she gets iron-clad evidence of a money-laundering scheme, Miriam thinks she's found the story of the year. But when she takes it to her editor, she's fired on the spot and gets a death threat from the criminals she's uncovered. Before the day is over, she's received a locket left by the mother she never knew - the mother who was murdered when she was an infant. The knotwork pattern within has a hypnotic effect on her. Before she knows it, she's transported herself to a parallel Earth, a world where knights on horseback chase their prey with automatic weapons and where her true family is in charge. The six families of the Clan rule the kingdom of Gruinmarkt from behind the scenes, a mixture of nobility and criminal conspirators whose exclusive inherited power to walk between the worlds makes them rich in both. Her unexpected return will supercede the claims of other clan members to her mother's fortune and power, and whoever killed her mother will be happy to see her dead, too. But Miriam is no one's pawn, and is determined to conquer her new home on her own terms. 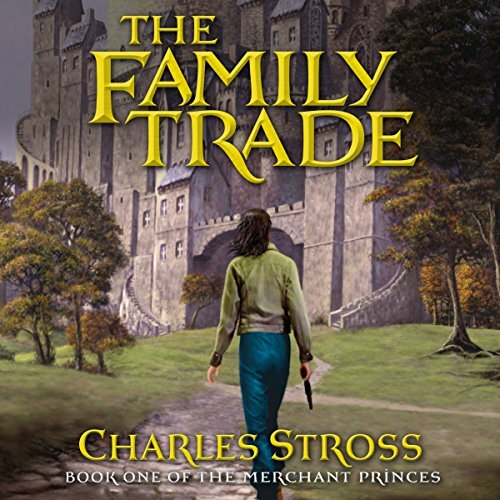 Blending the creativity and humor of Roger Zelazny, the adventure of H. Beam Piper and Philip Jose Farmer, Charles Stross has set a new standard for fantasy epics. Got about 2/3 done but could not finish this. Boring worldbuilding, blah protagonist, predictable plot, cardboard characters, terrible dialog. On top of all that, the audiobook reader, Kate Reading, sounded about as exciting as a robot. Only reason I got as far as I did is that I have enjoyed other books by Charles Stross, but his usual dry sense of humor was nowhere to be found here. I finally realized I didn't care what happened to any of the characters, and downloaded my next read. Charlie Stross creates a phenomenal/creative multiverse that really makes you think. Some of the things I wondered about are not developed until later books but he always out does my expectations. Charlie introduces lots of unexpected twists and turns through out the series. He may not be as hard on his characters as George Martin, but he can be ruthless. (He doesn't make death gruesome or revolting, but there is no doubt about the feeling of loss.) He doesn't seem to believe in everyone riding off into the sunset and living happily ever after. Life is hard and choices have consequences, but the series is adequately escapist. I did think it could be better if it was a little shorter, but it was certainly a fun romp and worth the investment. Finally, Kate Reading was a fantastic reader. She brought the characters to life and let the story develop. I recommend the entire series. The first book had a very intriguing premise. The story had some inconsistencies, but I put up with them for the sake of the mystery. However, the second book was boring; the characters tedious. It was in a different setting from the first one, so you any expectations you have from the first aren't fulfilled. My son, who listens to the audio books I buy, got to the third one first. He told me not to read it, so I didn't. don't waste your time or your credits!! I loved Stross's Laundry Files books. if that's why you're here, turn back. I wanted to like this series. the premise is interesting. unfortunately, the execution is inept. the characters are boring - Paulie would have been a much more fun MC, too bad we got Doctor Journalist. I tried to give this series 2 books to grab me but I just couldn't. there are so many good ideas here, too bad Stross didn't feel like picking one or two and fleshing them out, rather than bouncing from idea to idea and getting nowhere. First I want to say the author has great imagination and vision. There is a lot of deep thought in the storyline to make a saga. That said I found that this book lacked a certain level of action and intrigue. The book will have your attention and then it just fizzles out. I feel that it is about to get interesting in the following books but I don't want to spend the money or time out of fear that I will be wrong. The narrator wasn't bad. I detected a lot of the UK in the New England accents but for me it was amusing. I think there may be some other genres by this author I should check out because I like the style that was being developed but this book in particular didn't do it for me. I have picked up Stross books in the past and have not been able to find the supposed redeeming qualities others reviewers do. This is a strange story. I like strange stories. But this one has too many lethargic uninspired observations. The underlying plot has a lady reporter adopted at birth finding out she is part of a clan that can travel between our world and a second copy of our world stuck in the Mid-evil era. The clan rules over there gaining great wealth by being drug couriers in this one. Basically the novel is about fish out of water learning about either that world or this, political infighting, and B romance. Character development, the underlying sci-fi/fantasy concept, dialog, and plot are all below average. I think this techie author read a manual called "How To Write Sci-Fi/Fanatasy For Dummies". The resultant world building, characterizations, and plot progression are shallow and incongruent. Its like listening to a crappy first-person game with audio description. Kate Reading, the narrator, saves the book from a one star rating. loved it. it was intense and fun. thrilling and funny. a masterpiece indeed! read it. there was times that I was intrigued and there were times when I wish it was over. there were some twist but I wish The Twist were a little bigger. Also some predictability however it would be a great mini series. The characters and story are good. There is a bit a lot to set up. There isn't as much magic and action as expected. The rules of travel, political intrigue are interesting. I look forward to next part on series.